Replacement playfield mini post. Wood thread base. Measures approx. 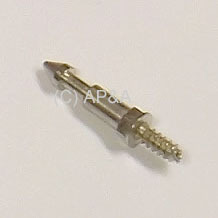 1-inch tall and installs into playfield wood using 1/4-inch deep-well socket driver. This post has 1 groove for a rubber ring. Holds one mini-post rubber ring, or larger ring may go around this post, depending on application. Replaces Data East / Sega / Stern Pinball # 530-5004-00, Williams #s 02-3905, 2A-3905, Gottlieb #s 14792, A-14792, Stern # 2A-200, and more. Can be used on most makes and models. GOTTLIEB: Asteroid Annie, Charlie's Angels, Cleopatra, Close Encounters, Count-Down, Lights Camera Action, Roller Disco, Surf 'n Safari, Tee'd Off, Title Fight, Torch, Vegas, Waterworld, more?